The pomander has it’s origins back to the Middle Ages. Today, the Pomander is more associated with Colonial times, however, research varies if they were made mostly with apples or oranges. 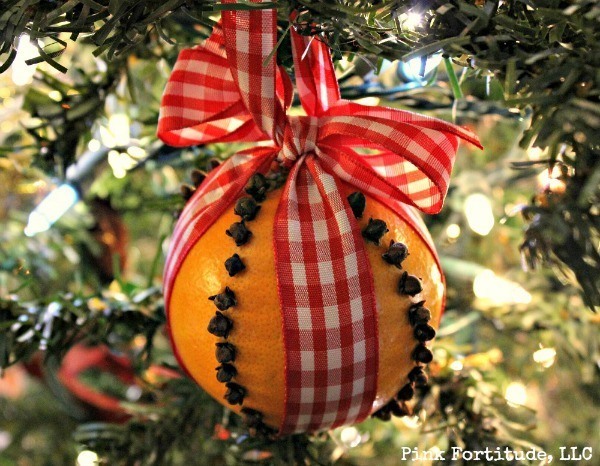 Nonetheless, a Pomander is a fragrant and festive decoration you can display at home, or give as a Christmas or holiday gift. Pomanders date back even before the Middle Ages. It was originally known as a ball of fragrance that people wore around their necks. Beginning in the 17th Century, the English began making them with oranges, apples, and cloves. Our early Colonists made these treats around Christmas time, however, they were made with apples as oranges were too expensive. Now that oranges are a home staple, they seem to be the more common version. You know those recipes that call for whole cloves, and then you have an entire container left minus a few? This is a great way to get rid of them! You. Are. Welcome. I’ve seen tutorials that say to use a pencil to trace your design, and Martha says to use a rubber band. I just winged it. The design I made is a pretty traditional design, alternating between the cloves and the ribbon. You can make faces, or pretty much the possibilities are endless. 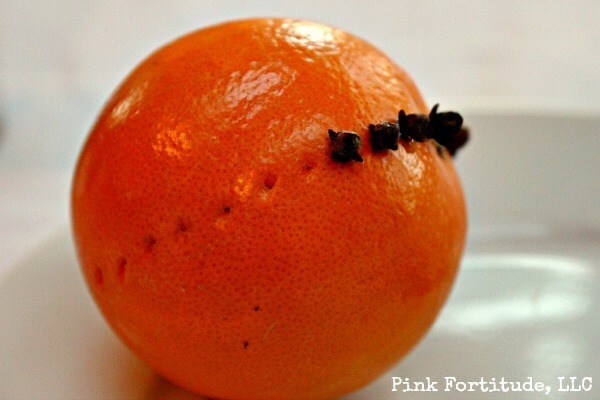 Use the skewer to make a slight puncture into the orange so that you can place the cloves without any trouble. Add a pretty ribbon and you are done. I like using checks or plaid as a nod to the Colonial times, but any festive ribbon will work. I started at the top, came around to the bottom, twisted it, and then tied the bow at the top. This kind of pomander will last about a week, maybe two before starting to go bad. Until then, it will be very fragrant! 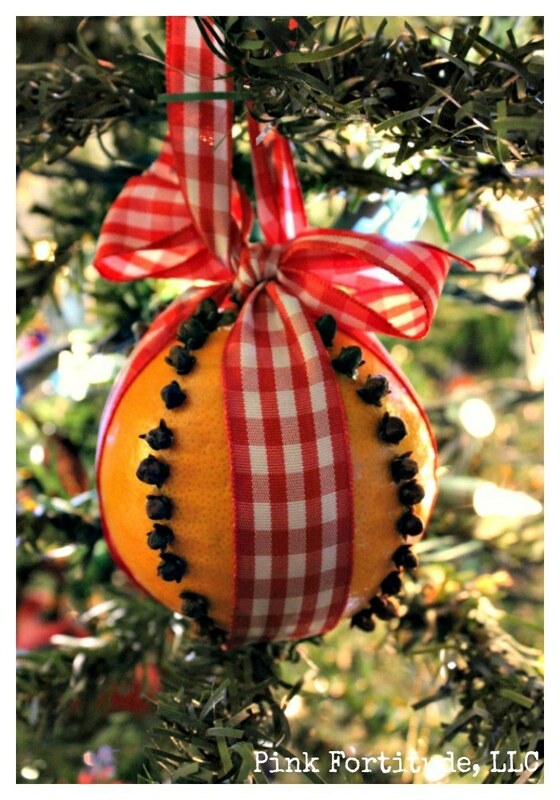 There is a different kind of way to make pomanders if you want to keep it longer – by covering the entire orange with cloves and using various spices. This type is more seasonal. You can hang it on a tree like an ornament, place it in a dish, give it to a friend… there are many ways to enjoy it! Love, hugs, and smelling good. Holly, I love how you can combine a quick history lesson with a craft! This is so charming and I can almost smell how delicious it is from here. It would make a wonderful clutter free hostess gift. 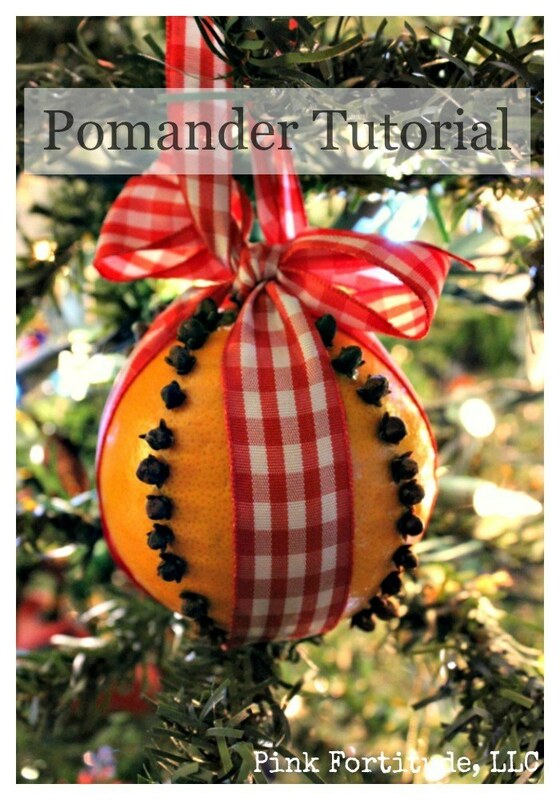 I love Pomander but I never knew what they were called. They do smell wonderful and you get to use clove which I only have very few recipes for. Otherwise, it just sit in the cabinet even though I love the smokey smell. This looks so pretty! I bet that would smell amazing with the oranges and cloves and then if you added a live tree too! Heaven. Thanks for sharing this on the Wonderful Wednesday! If you get a chance to stop by my blog sometime, I’d love it! Have a great weekend! This is such a great idea for the holidays. I’m sure it smells heavenly. I hope to make one. Merry Christmas! I’m planning on making these with my kids this week. Thanks for sharing this tutorial – so easy! Thanks so much for sharing on Show Me Saturday! Hope to see you again the first weekend in January! We made these every year as a kid, not sure when I ‘forgot’ about them! Thanks for bringing back some nice memories and now we will have to continue to make these each year! I love these. I never even knew the names of them. I had made some last year and the house smelled like Christmas. Thanks for sharing, the ribbon tip. I had put mine in a basket but it will also look very pretty up on a tree. How cute! I love how simple it is too! Thanks for sharing with us at the Merry Monday link party. I hope you’ll join us again next week. Sharing your post on Twitter! This looks like it would smell wonderful! Love this idea, going to share it with my nieces. I’m 63 & I remember making these in kindergarten. I had a very “crafty” teacher & this was just one of the many creative crafts she taught us. You can use lemons too. To refresh, just run some warm water over them. The smell comes out again and all is revived! Thank you Holly for a great and wonderfully scented craft for the holidays ! I can’t tell how you how many little containers i have of whole cloves in my cupboard. Every year i can never remember if i have enough cloves to put on my Thanksgiving ham, so i buy another !! What a great way to use up all the old, so i can start anew. And i love FranAnderson” tip to refresh ! Thanks ladies, Happy Holidays ! these. I can still smell them.My grandsons (6&8 will probably make them this year also. I’m going to make some for my Christmas tree! I usually keep a pot of Orange and apple slices, with cinnamon sticks and cloves simmering on my stove during the holidays! LOVE the smell! I had a Great Aunt that would make these back in the 40 & 50’s. She would completely “cover” the oranges with the cloves. That would dry them out and she could keep them around for a year or two.